Toys from a Galaxy Far, Far Away! While I was busy shopping for perfumes in Tokyo, B did a little shopping of his own too. Just because he's a guy, that doesn't mean he doesn't love shopping, especially when it comes to STAR WARS toys. He already has quite an impressive collection of toys and figurines, which he collected over the years and the last time he went to Japan without me, B purchased a cool lightsaber for almost 7000 yen! Imagine my face when he came home grinning happily; long sword in hand! So last vacation, we made sure Akihabara was on our list of places to go. 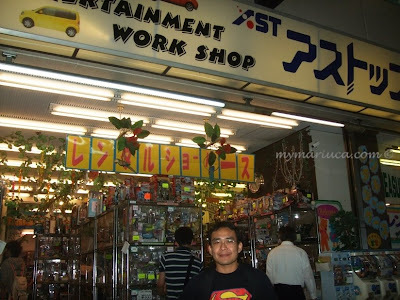 As the largest electronics town in the world, you can find all sorts of gadgets and toys in this part of Tokyo. B had his mind set on a specific Toy store that sells the coolest Star Wars toys and figurines. As usual we got lost but after making several circles, we finally found the store. Inside was all sorts of toys imaginable but you really have to search for the Star Wars toys since they don't come in abundance and are usually hidden in top shelves and corners. I got myself an adorable Pink Gizmo keychain, which I love! It also comes in purple and green by the way! While I was browsing the huge store, B did a little searching himself. He was not interested in the smaller items and we were about ready to leave the store when B spotted an awesome C3P0 figurine! It's quite heavy and it's big; costing almost 5000 yen. B contemplated his decision on this expensive purchase; after all 5000 yen is equivalent to approximately RM200 and to spend so much on a toy required some major thinking. 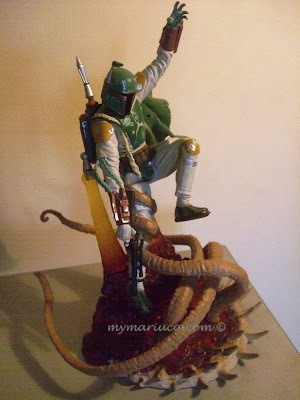 I reminded B of his 7000-yen lightsaber, which was way more expensive than this figurine. 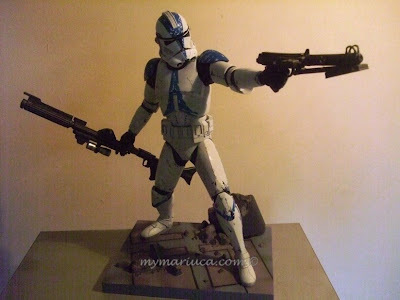 Plus, it's not easy to find Star Wars toys back home and even if we did find the same exact figurine here, I'm very sure it would be pricier. In the end, I convinced B to get this very pricey but very unique figurine for his collection. It did not come with instructions so we were unsure if the figurine does anything. It was only later when we got back to our hotel that I accidentally pressed the back of his head, which got C3P0 talking and his eyes lit up as well! What a great cool buy for B! 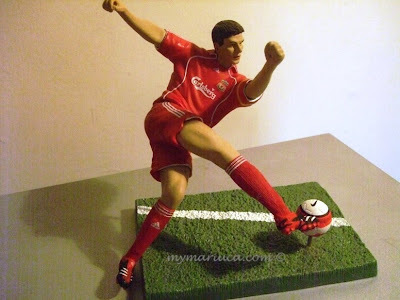 Oh and this one here is a Stevie G figurine! It has nothing to do with a galaxy far, far away but this is B's favourite football player, which also forms a smaller but equally important part of his toy collection. I'm so glad B got some new Star Wars toys for himself. Now, I feel less guilty about all the perfumes I spent on and we both get to enjoy our collecting hobby together! 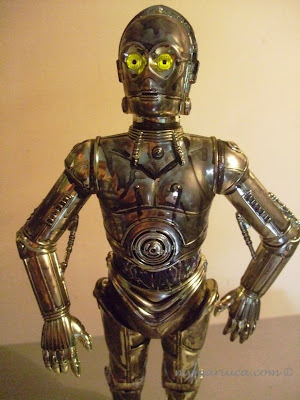 wowww.. C3PO is soooooo coool!! and B has an R2-D2 alsoooo kan?? and the gremlin is sooooo cute!! LOL! U got this one marvic, yay! So cute kan Shemah? Sayang nak keluar from the plastic oso, this one I had to take out from the packaging for pics purposes lol! Yay! I love my pink gizmo, Mon! And it is the cutest, should have bought all three colours he he he!!! Yay for R and Star Wars! R oso collects SW toys Mon?? Ohhhhh Nessa SSG (sneaky speedy Gonzales) today!! lah kempunan nak tgk!! LOL! own one closest to the original light sabers!! LOL! 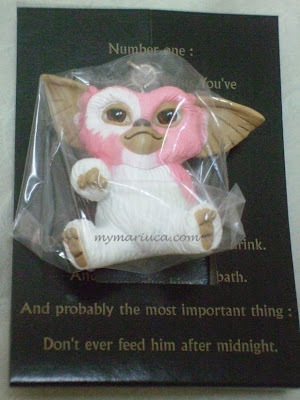 Hahahaha comel sungguh si pink gizmo tu!! :-) :-) LOL! Eh mana ada light saber pic with Pheebs??????? Ohhhh sorry! R2 pic u mean hehehehe yeah! That’s one of them Shemah hohoho!!!! Kecomelan la my Gizmo, I will use it today since dah remove from plastic lol! Ok sweetie, hope u get my meow chop then! Wait ahhhhhhh, uploading video la now! So slow la this stupid blogger, everything oso slow today! i didnt finish my drops oso yesd! I finished my drops very late Mon! :( Lazy to drop today though…. Hahahhahaha same here la, but imagine me have to drop 900 Mon, sigh!!! I mensi pasal lightsaber pic with Benj, Shemah, not the one at MD of Pheebs and R2 he he! That one u blm tgk kan? Benji pic that is! yalor u ve to drop 900 some more! u need how long to drop 900 Mariuca? wahhhhh whole freaking day and night?! Oh the one with Benji?? Noooo.. tak pernah tgk lagi gambar tu!! wah.. you guys got so many collection.. so awesome!! and I love Pink Gizmo.. lol. so cute!! those figurines are pretty cool but it's pricey as hell to be a die hard fan. the Pink Gizmo looks cute. Wow! B really likes to collect figurines huh! :) I don't have any though. Yeah of course Marzie! :-D cause I am a Star Wars geek so it's totally cool! iv, v and iv Shem, they're a bit pricey!! :-D am saving for it! Oh yay! Hope u like the pics Ane! Meow! Too many things oso can cause prob to our lappy kan, like slow it down! yeah not only can cause prob but oso slow it down! !